There's a new night devoted to all things hard and grubby in London, and here's a transmission to tell you about it. Chasm has been founded and is run by sister and brother duo Isabel and Joe Spurgeon, who you might well know as the drummer of The Horrors. 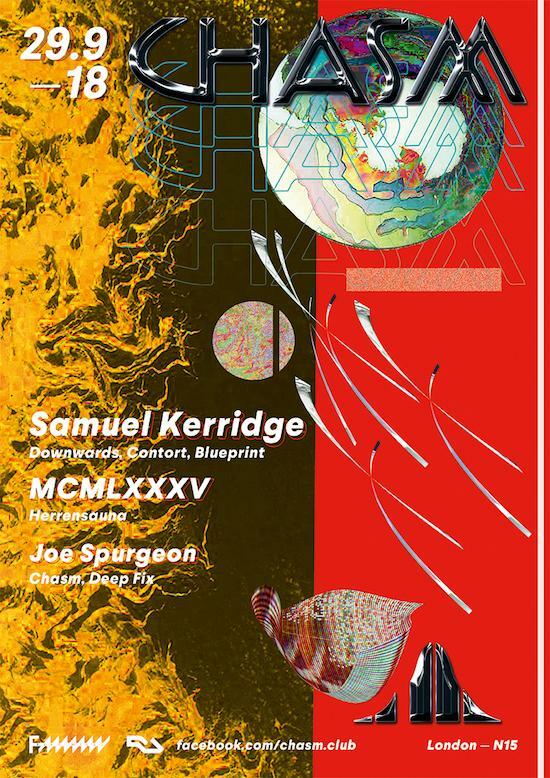 Taking place at the Five Miles Brewery, the next instalment on 29th September features Samuel Kerridge of the Downwards label and MCMLXXXV from Berlin's Herrensauna. Joe has done tQ an excellent mix of current anxious urgent & sticky techno which you can listen to via our Mixcloud above. Get tickets for the party via RA here. We had a chat with Isabel and Joe about the plans for Chasm: "We've always had a deep love for techno, whether it's hard/hypnotic/dubby, we enjoy it all." they say. "We've also never really found the time to make music together but thought we could just about handle doing a night – the plan is to do Chasm four times a year and that will hopefully satisfy our craving." What nights have inspired you? The Spurgeons: People Drift - Ormside Projects run by my friend Jim Janco. It’s a place that I always return to knowing I’ll have as much fun as I did the first time I went. I’m always learning about new DJs at this night which I think is what it’s all about. KAOS is another one of our favourite nights. It has a diverse emphasis and always brings a sense of community that falls outside the banal and normal. I like the fact that KAOS have built something from the ground up and remains a platform for those starting out, as well as the established. Possession - Flying Dutchman/ Rye Wax with Tom Unlikely and Proteus too. What makes a good night out? TS: Community! Anything that’s able to remove you from the constant strain/struggle of life under neoliberalism. I feel this weight overpowers us all in our day to day lives, and I think dance culture is a great distraction from that. The nights that stick out in my head are the murky, sweaty and strobe-induced – it’s so physical with hard pounding techno, but then I also like the opposite end to that spectrum. To have no pre-conceived opinions about a night can be exciting too. I guess the nights that feel like they never pause or stop. TS: What are you most looking forward to?